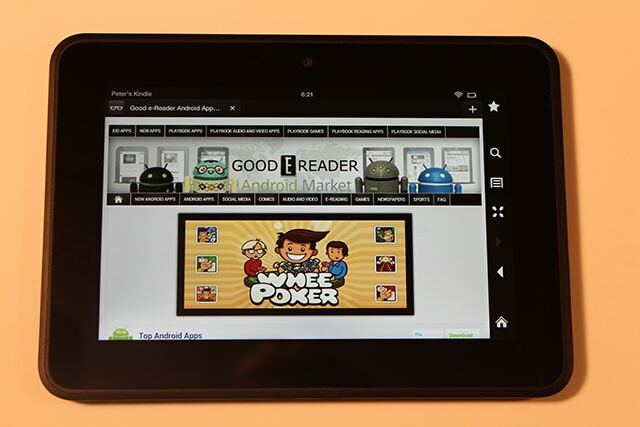 Amazon released its followup to the wildly successful Kindle Fire Tablet recently. With upgraded hardware, software, and a new UI, it is poised to dominate the tablet market into the holiday season. How does it rank up against the original and is it a solid investment if you are looking for a great Android device? One of the other upgrades from the previous model is the addition of a Micro HDMI output to stream media directly to your television. Many people had been wanting this feature to watch movies in their media center or do presentations at work. Many tablets actually never bother with this ability because it’s a niche market that actually employs it, but it is a welcome change. Amazon has done away with almost all physical buttons on this edition of the Kindle Fire HD. You merely have physical power and volume keys that allow you to quickly get things under control. If you do a short tap on the power button it will put your Fire into standby mode. Special Offers ships on every unit and you will be greeted with advertisements on the standby screen. For a nominal fee of $15 you can have them removed. There is a front facing webcam, which is a feature everyone had wanted in the original iteration of the Fire. This is perfect for people who want to use programs like Skype or other video chatting programs. You will get around 10 solid hours of browsing the internet and using the device in a myriad of ways. There are no DC ports, and you would charge it up using the Micro USB cable that came with the unit. It measures at 7.6 x 5.4 x 0.4 inches (193 x 137 x 10.3mm) and weighs 395g (13.9oz). It is a bit lighter than the original Kindle Fire and a bit slimmer, too! The big new feature found in this model is the dual WIFI access! No matter how far away you are from your router in the home, the bars never went below full connectivity. Amazon really invested a ton of time into making sure that the WIFI only experience was very solid. In the end, this is one of the most responsive tablets I have ever used and we have reviewed over 400 in the last few years. With over 20 things open, we were still able to play games, watch HD video, and browse the internet with no stuttering or lag at all. 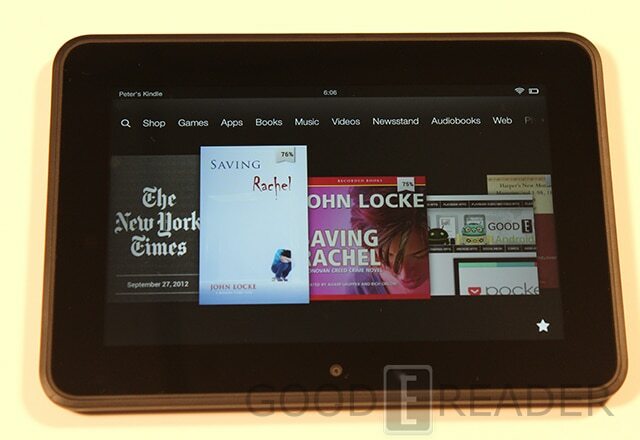 The new Amazon Kindle Fire HD 7 is running on a more modern version of the Google Android OS with 4.0 as the core. This will allow you to run a wider array of applications and give you a better experience than previous iterations. The entire UI has been redone for this version of the Fire, with the carousel being one of the few things carried over from the original. Any web pages, books, apps, or anything else you have loaded will appear here, giving you an easier way to access the last few activities you have ran. One of the drawbacks is if you sideload in your own applications, books, games, or media, the icons often become severely pixelated. Anything you buy or download from Amazon will not suffer from this problem. I would say that the top navigation bar is the easiest method to interact with all of Amazon’s core features, and it is the best in the business. It has Shop, Games, Apps, Books, Music, Videos, Newsstand, Audiobooks, Web, Photos, Docs, and Offers. This is almost double the amount of options you had in the first generation Kindle Fire. It helps organize your growing library of content in better ways. When you access the Fire HD with Calibre or Windows Explorer, you can easily copy and paste things into specific directories so it shows up in the areas you want it to. The entire Amazon ecosystem for apps, games, audiobooks, ebooks, and other stuff has been revised. Everything seems a bit more intuitive and touchscreen friendly with the swipe-able carousel. It is easier to show more on a single screen with everything able to be swiped right and left with a gesture. X-Ray is a feature that was once limited only for ebooks for the Kindle Touch, but has now made its way into the Fire HD. This is applicable to both movies and books and aims to uncover more details about the topic or subject with a simple tap on the screen. For movies, a tap on the screen will reveal who the actors are in the particular screen, what other movies they are involved in, and other trivia. Whispersync is also a brand new feature that is applicable to games, books, and video. Whispersync for Video will save you the frustration of having to search for the spot where you have left off with your video on your Kindle Fire. Whispersync for Video will start exactly from where you stopped when you switch on your TV or a compatible device. All game titles played from GameCircle will be saved automatically in the cloud thanks to Whispersync. You can be sure that all game settings, unlocked levels, and trophies will be saved even if you have deleted the game from a particular device. The Audible integration allows you to purchase audiobooks directly on the Kindle Fire, so you can enjoy professionally narrated books while you are on the morning commute. You are looking at an average cost of $6 to $12 and features most popular titles like Lee Child, Suzanne Collins, and EL James. Amazon’s bread and butter is obviously the ebook store and peddling hundreds of thousands of books. You mainly have the best sellers and new additions on the main page, but it also has new features. Kindle Serials is taking a prominent place in the UI of the bookstore and is hopefully going to generate massive interest in the types of serial books that were popular in a long gone era. Of course you can buy graphic novels, kids’ books, and access the Lending Library. Every purchase of the Kindle Fire HD gives you access to Amazon Prime, which lets you watch Instant Videos and borrow one free ebook a month. Amazon has also revised its app store, which is heavily competing against Google Play and other major markets. Whenever there are discounts on apps, games, or books from Google, Amazon instantly matches it in its own app store. This gives customers the ability to download many things for free or reduced prices. The company also flags a specific app every single day that’s normally paid and makes it free, as incentive to keep visiting daily. Most content from Amazon only works in the USA right now. If you live outside the US you are severely limited in the content you can purchase. Since the Good e-Reader team is Canada based, we tested out the things that work and things that don’t. You can’t download music, apps, newspapers, videos. This limits you to only being able to purchase audiobooks, ebooks, and graphic novels. Whenever you try to download free content that comes with Amazon Prime or free Apps, you get the message that you need a USA Billing Address and USA Credit Card. If you can manage to get your hands on these, you should be good to go, but in some cases (like video) it still says “Geographical Restrictions” are in place to prevent you from watching movies. Speaking of apps and games, one thing that is very user friendly about the Kindle Fire HD, is that users can load in their own content. Amazon may be a walled garden, but does not restrict customers from loading in their own apps, books, photos, videos, music, and tons more! Barnes and Noble is notorious for cutting off the “install from unknown sources” feature that allows you to load in apps. 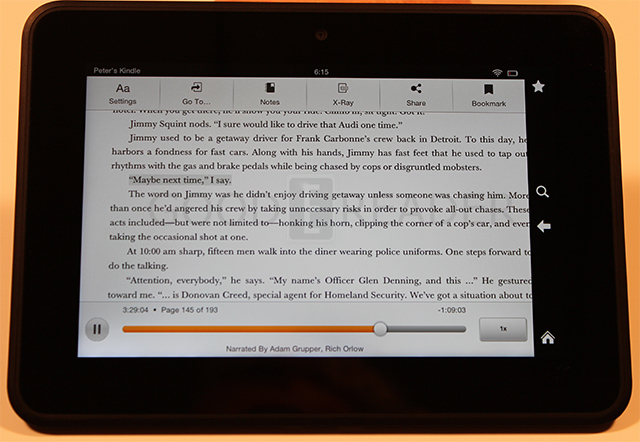 Amazon will allow you to install our own Good e-Reader APP Store, Getjar, or 1Mobile market. If you live outside the USA, I would strongly urge everyone to install an alternative market so you can actually download new programs. The color theme of the entire Kindle Fire HD 7 UI is very dark and classic. All of the stores, menus, and features are very clean. The black background permeates across the entire device, which makes color really stand out. In the end, the Kindle Fire HD 7 is a culmination of Amazon’s entire ecosystem and hardware joining together to provide a user experience unlike any other. Everything just works, and with the skinned UI that the company provides, it is far from the Vanilla Android experience that Acer, Asus, Samsung, and every other manufacturer provides. e-Reading on a portable seven inch tablet is always a bit easier than rolling around with your iPad. Amazon has invented some innovative new features that take reading and audiobooks to a completely new level. 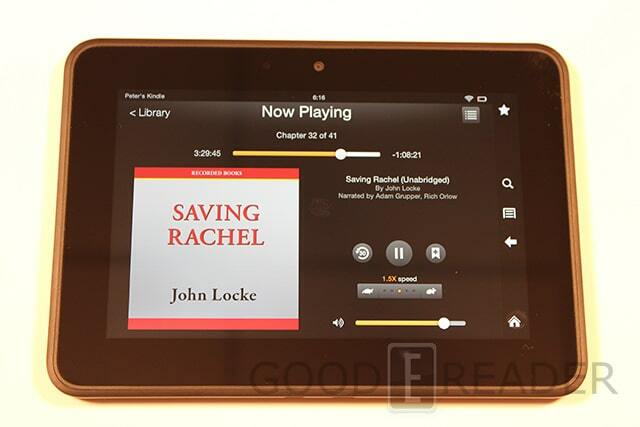 Immersion Reading brings new harmony to ebooks from Amazon and Audio Books from Audible. It basically allows readers to synchronize a Kindle text with the Audible audio version of that work. While you are reading, the ebook is highlighted as the audio track moves along, making it easier for the reader to follow along. One of the more useful ways you can employ this is by reading a book and listening to the audio version at the same time. People learning new languages could also tremendously benefit from this and don’t forget kids’ ebooks. Whispersync for Voice is another new option that, in essence, allows you to read the ebook at home and then pick up where you left off on the audio version. When you are reading an ebook on the Kindle Fire HD, you have tons of standard options to tailor the book to your own personal preference. You can choose between eight standard fonts and around ten different resizing options to find that sweet spot. You can also adjust the linespacing and margins. If you are reading at night, you can quite easily turn on the nighttime reading mode and make the background black and text white. Page turn speeds are very quick, but there is no turning animation that you would see on the Kindle for iOS app or iBooks. X-Ray for books is making the trip over to the Kindle Fire HD and gives you the ability to look at all the main and minor characters in a book. You can get character biographies and see how many times they are mentioned throughout the ebook. This is quite useful if you start reading a book and then come back to it a few months later. Often when you do this, you tend to forget what is happening, who the characters are, and what’s going on. X-Ray will bring you up to speed on the event happening in the book and allow you to look up specific things on Wikipedia. X-Ray and Immersion Reading only work on ebooks purchased directly from Amazon. These features do not work on books you have downloaded on the internet and loaded onto the Fire yourself. PDF reading on the Fire HD is fairly excellent, with pinching and zooming being the go-to method for tailoring the experience to your personal preference. There are no options to customize PDF files that you have loaded on yourself. The only thing you can do is pinch and zoom. Comic books purchased from Amazon run under a new engine that is much akin to reading them on dedicated apps like Marvel, Comixology, and others. Plenty of options abound for the serious comic lover. Newspaper and magazine reading is fairly solid and stood up to the iPad 3 in head to head tests. One of the downfalls is the newsstand content consists mainly of newspapers masquerading as dedicated applications. When you download the New York Times or USA Today, you are in effect downloading a singular application, which you can’t do if you live outside the US. To get around this, you can simply pick up your newspaper’s equivalent of their Kindle edition. This will make the newspaper read more like an ebook with all the settings to augment the reading experience as a normal book allows you to do. You miss out on some of the cool UI elements that are found in the dedicated app. In the end, Whispersync for Voice, Immersion Reading, and X-Ray are three critical factors that really take the Kindle Fire HD 7 to a new level for reading. You may not employ these on a day to day basis, but if you are a huge fan of audiobooks, this investment will pay off in spades. X-Ray is something that would appeal to the types of people that often juggle many books at once and sometimes lose track of where they are. eBooks allow you a tremendous amount of flexibility to read in either landscape or portrait mode and provide enough customization options for the discerning reader. I really dig the fact that you can load in your own ebooks in MOBI or PRC format that you downloaded from the internet. You can also use Calibre, which is a very excellent ebook management program to convert your EPUB books over to the Kindle Friendly format. Don’t forget, you can also get books from the library via Overdrive and read them right on your Fire HD. The Amazon Kindle Fire HD certainly puts all the other tablets under $200.00 on notice. The combination of dual-core processors, webcam, 1 GB of RAM, Micro HDMI, and a high resolution display screen absolutely destroys most mid level tablets that are currently on the market. You get tremendous value for your money, even if you are locking yourself into the Amazon ecosystem. The things I like about this are new features like X-Ray, Whispersync for Voice, and Immersion Reading. I can really see myself raising a little kid and teaching them word correlation with kids ebooks and the audiobook version. I learned how to read back in the day with Star Wars read along records and the accompanied book, and this is the modern version. I also really like the ability to load in all of my own content, which many tablets like the Nook and iPad don’t allow you to do. Since I live in Canada, it is impossible to enjoy this tablet to the maximum and international customers are severely limited in the things they can purchase or download for free. This is the number one drawback, and anyone outside the USA should strongly consider this if you are thinking about buying the Kindle Fire HD 7. Of course, there are workarounds. You can simply install the Good e-Reader APP Store and download Netflix, Hulu+, Marvel Comics, Zinio, Press Reader, and other popular programs to get all of your content you couldn’t otherwise access. It’s jumping through many hoops instead of “1 click downloads,” but at the price, you maybe inclined to do it. Audio completely won me over to this tablet. Whether you are watching movies, listening to music, or enjoying audiobooks, there is an unrivaled experience. If you look at the iPad 3 with a single speaker, and then the Kindle Fire HD with twin stereo speakers with Dolby Surround Plus technology, it is clear who wins. The only drawback is that if you are big fan of audio docking stations, there isn’t much in the way of accessories out there right now. Although, it does have a smartcover that automatically puts it into sleep mode! does anyone know if there are any Tablet’s (ie. Kindle, etc.) that can be used by the seeing impared besides for the Audio books. Looking for Voice activated for all functions on a tablet is it is out there. Was all set to buy when read this full review. I know there is an Amazon store in Canada so what is the problem? The Cdn dollar is worth more than the US so that isn’t it. Fill a room with fifty random Americans and fifty random Canadians and it is doubtful many can tell one from the other. Maybe 35 million people isn’t a big enough market. I don’t get it. Why is there such a difference between the same readers sold in US and sold in Canada when it is the identical machine? Regional and Country licensing agreements, royalties, distribution restrictions and so on. In my testings i found that Overdrive Library eBooks was a great innovative idea which i enjoyed. But i think it depends who you are and what layouts you like and is use to. 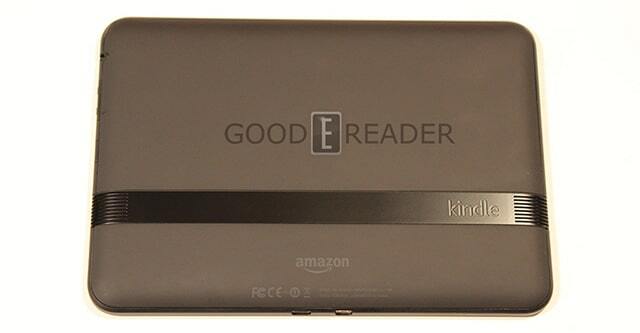 This Kindle will read aloud any non-audio book you put on it. There is a feature you can toggle on in the Book reading app that reads the book to you. It does not have to be a book you buy from Amazon. It tracks where you are in the book and turns the page for you. The voice is somewhat robotic, of course, but it works well.